I mean, I really hate sewing. I loathe, despite, detest, and abhor it from the deepest pits of my being. I don’t believe there are adequate vocabulary words in the English language to express how I truly feel about it. Don’t get me wrong: I can sew. I just hate it. I’ve hated sewing since I was a child. My saintly mother, who sews magnificently, could never understand why I didn’t share her delight in creating beautiful garments from virtually nothing. Despite all her patient efforts and skillful mentoring, the mere act of putting needle to thread still fills me with hateful frustration and dripping venom. A dear friend is a master of the needle arts. She can crochet, knit, sew, tat, embroider, and otherwise conjure up endless astounding creations with the magic of her fingers. It’s a joy and a treat to watch her at work, but you won’t catch me dead trying to emulate her. My parents gave me a Singer sewing machine sometime in the mid-1980s as a Christmas gift. It’s been a faithful machine all these years, and I've used it a lot (yes, really; there are times I do need to sew), but it kept breaking down and it got to the point where repairs were more expensive than the cost of a new machine. 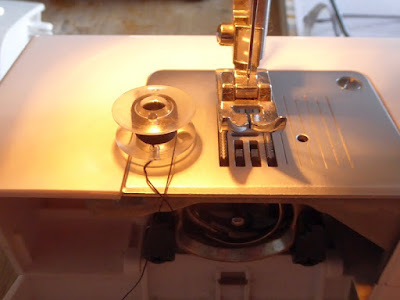 Younger Daughter (who doesn’t share my hatred of the needle) needed a machine for her own projects, so after years of procrastination, I purchased a Singer 2259, billed as geared for “beginning” sewers. I was pleased to find it was far more affordable than anticipated. But Younger Daughter had been the one using it. Me? I avoided it like the plague. However, faced with the desire to hem the new curtains I recently hung across the pantry, it was time to figure the thing out. 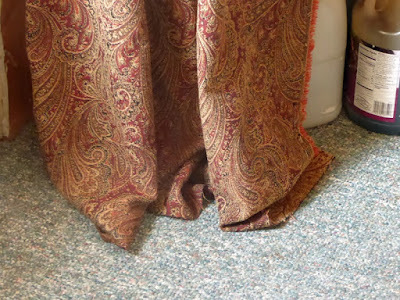 I flirted with just hemming the curtains by hand, but knew that was a cop-out. I had to face the new machine. Ug. Right away I started feeling the old familiar sheer loathing I always associate with sewing. First I needed to wind the bobbin. I’d misplaced the user’s manual, so I found one online. But figuring out how to do the simplest thing on this new machine had me wanting to pull out my hair in frustration. I could literally feel a weight like a band around my chest, of loathing for all things connected to the needle arts. Arrrggghhh, how can anyone do this for pleasure? I watched a YouTube tutorial on getting started with this machine. For heaven's sake, this machine is for beginners! It's supposed to be simple! What on earth is wrong with me? After endless delays and setbacks – admittedly, most of them mental – I got the two seams sewn. 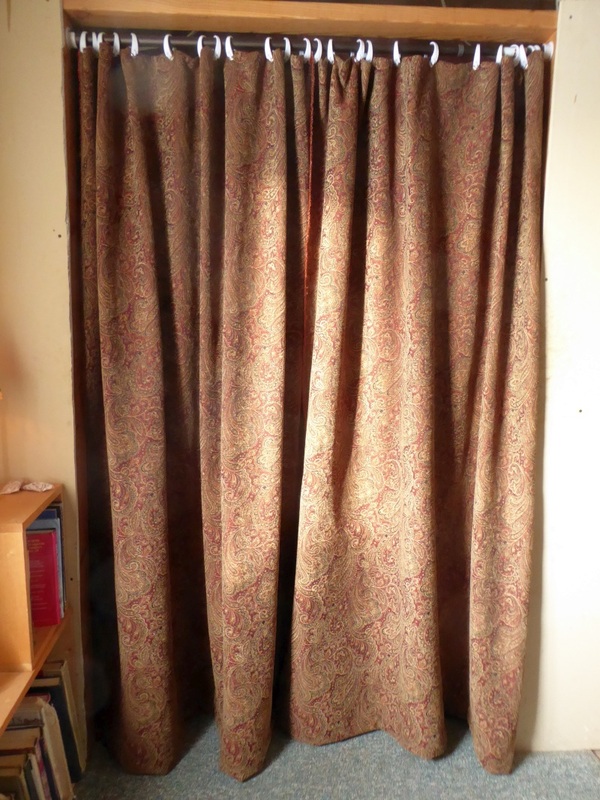 Then I hung the curtains, gave my face a good scrub (which works to scrub my brain as well), and felt much better. My mother can sew a pair of slacks or a skirt in less than an hour. It took me two hours of fussing to sew two straight seams. I – HATE – sewing. I passionately admire those who are skilled seamstresses, but you'll never find me among their ranks. I should make it clear there's nothing wrong with the sewing machine. There's something wrong with me. Lord forgive my temper. Go ahead and rant! Everyone is expert at something and frustrated by something else. You acted like an adult though and got the job done. You can be pleased with that. And the curtains look great! I was never TAUGHT sewing. My mother and sister both sewed beautifully. I was the one who cut out the fabric after one of them pinned the pattern on it, sewed in hems, put on buttons, etc. Apparently I was supposed to learn by osmosis. When I was on my own, I learned to sew by reading a book and studying patterns. I made a lot of clothes for myself, sewed for my daughter, and made things for our home. My husband thought of me as an expert. While my daughter was in college, things changed at my job so that I would come home so exhausted that the thought of doing anything more than the basics around the house were more than I could handle. I got out of the habit of going to the sewing machine to make anything. I just mended as needed. After I retired, I found myself unable to get back to the point where I sewed things. Still just mended. I may never actually sew a garment again. Apparently sewing was a habit that was broken over years of job stress. I had to laugh at this. I feel the same way about sewing. When I needed to hem a set of curtains last year I bought some fusing tape. I was done in 10 minutes and no sewing required. I somehow feel so intimidated by my machine. My grandmother always made it seem so simple and sewed everything beautifully. Your curtains do look great! easy to understand and work. mine have no electricity and use the treadle. there are also ones that you turn the wheel by hand--no treadle-- but i think you need three arms or a husband to turn it, because i need two hands to hold the fabric. it is a good thing to have, 'just in case'. get several of the leather bands for the treadle wheel-to- machine wheel and store them. don't want your band to break and no replacement way out where you live. Take heart; men are supposed to be experts at "handyman" chores. ...I truly HATE plumbing! I don't think "loathe" lends enough weight! I feel the same way about sewing! My sister is a master of needle arts just like the lady in your post. I, on the other hand, would much rather be outside mucking horse pens, goat pens and sheep pens than even think about getting out the sewing machine! Patrice I can understand your frustration on doing something you loath.. for me it is wall papering. Anyone that knows me heads for the hills when I start pulling out the supplies. I am usually soft spoken and rarely use a naughty word , I could make a sailor blush when matching patterns . Heavens, I'm so sorry. My deepest condolences. Hang in there. 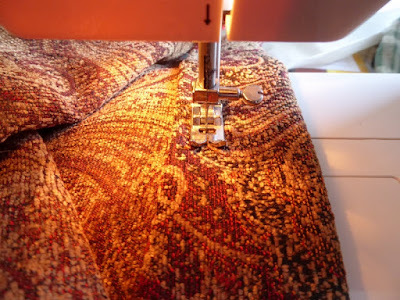 I'm pretty sure that there are demons that are assigned to come to my house every time I get the sewing machine out, just to make things go wrong. There is nothing wrong with you or with me, it is just that sewing is a persnickety process to mechanize...there are the layers of fabric, plus two threads, plus all the moving parts of the machine, plus all of the lint that ends up inside it; lots of things that can go wrong. Even if they don't, the bobbin thread is going to run out sooner or later. I have a solid older machine, and so far I have been able to troubleshoot my way through each problem. The last time, the needle wasn't facing quite the right way...that one took me a while to track down. Paint the rings to match the rod--it will look much better. We plan to install barnwood trim to hide the edges, including the rings. Sewing machines and I do NOT get along at ALL! I have two antique machines that I had hoped I would some day master. But, I'm in the same boat as you are-----they get my goat any time I try to use them. I give up! I like the results of being able to sew, but I too can make a sailor blush while doing it! I will say this- I got my daughter one of these singer "beginner " machines, and several of a different model number for my students at school, all supposed to be "easy ". I've found them all to be fussy and persnickety to use. I have a bernina my hubby saved for a year to give me as a Christmas gift when we first got married, and although she has her days where we fight, that machine is way less cranky than the singers. It also seems to have held it's value pretty well. I do have a fancy model serger we found at an estate sale, as local 4H said they liked to see projects serged. Oh my goodness! That thing and I will NEVER get along! I've even had it serviced, and there's just no way. It's like Woodstock and the chairs in Charlie Brown Thanksgiving!!! Birds of a feather... I can say that was the only "D" I received in high school. Pretty bad on my 4.0. I wanted to take wood/metal shop but girls could not at the time (the 1970's). But as I got older, for some reason I bought a JC Penneys machine and have muddle through different projects, like the 3 vests my daughter asked me to sew a week b/4 Christmas for my granddaughter...With zippers! Now, if it something that should look nice, I take it to my girl friend and have her do it. Thank God for best friends. I noticed that your spool 'cap' was different then what was the youtube screen shot but I'm sure you figured it out. Good job on the curtins. Something you can be proud of. I adore sewing. When everything else here is going to hell in a hand basket, I retreat to my sewing area and chop up felted wool sweaters and zigzag them into blankets, or I chop up some old men's dress shirts and sew them into a quilt. I would lose my mind if I didn't get to sew. You are having problems with your spool cap because it is on backwards. I know it LOOKS like it should go on like that, but it doesn't. 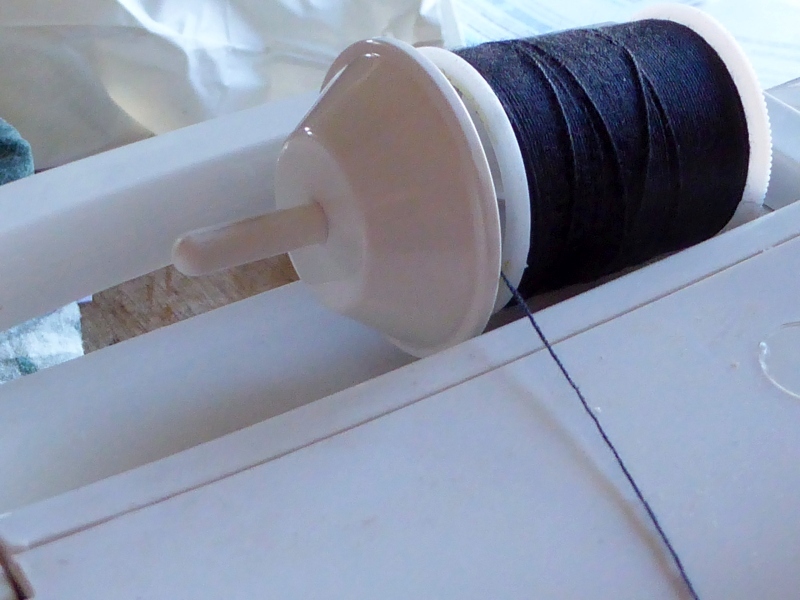 The smaller end goes toward the spool. Then your thread will come off the spool the way it should, instead of wrapping around the post. Hope this helps. I hate cell phones. I've found a good coping mechanism. I put old cell phones on the range backstop and shoot them. It feels soooo good. This also works well for United Nations and DHS decals too. Be careful of ricochets off old sewing machines. This was a great laugh, for myself, because I feel very similarly regarding cooking. Put "cooking" in place of your word "sewing" in the first 3 paragraphs, and that is how I feel. I know 98% of your readers will not understand this, but it is true. Cooking drives me crazy, because it is just not my thing. I do try every day for the sake of my family, but I will never be an expert. No need for others to try to tell me what to do; my mind simply doesn't wrap around the kitchen thing. Thank God my husband is an excellent cook, who cooks most Saturdays and every Sunday, because he likes to. He says I do succeed at cooking since the family does eat my cooking. I am a very happy and optimistic person, but not during the cooking hour, as that is my most unhappy time of the day! Guaranteed if the recipe says it takes 30 minutes, it will take me at least twice as long. This little quote was sent to me by someone who knows me well: I only have a kitchen because the house came with one. 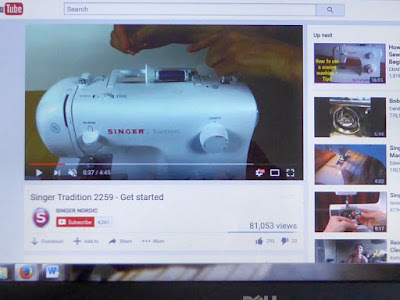 I attempted to learn to sew on my Grandmother's antique Singer with similer frustrations. I had to relearn how to thread the needle and load the bobbin each time. 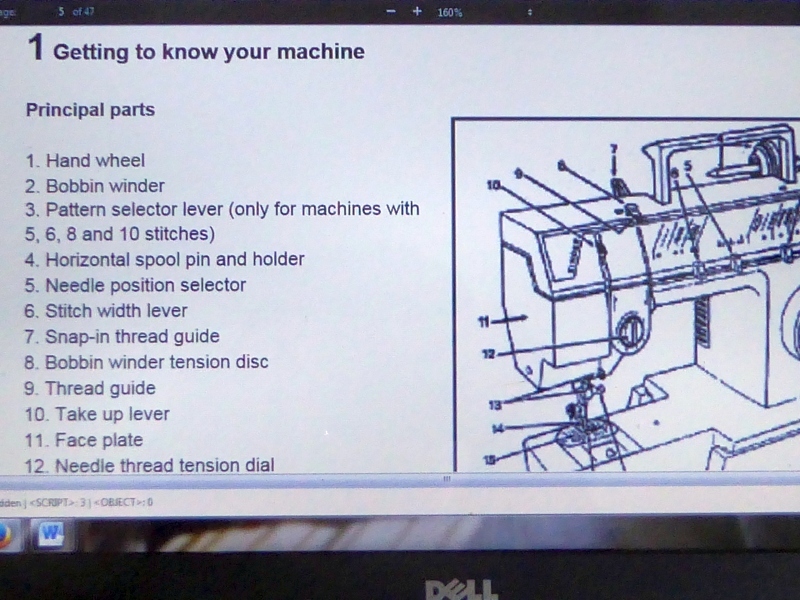 I finally chose to buy a new machine from the local vacum and sewing machine store because they offered free lessons and the owner was willing to answer any questions over the phone. While he was showing me the sewing machines this happened many times. I was impressed by how knowledgable and helpfull he was. I tested many machines set up in his store. I chose a Necchi made by Janome. I was willing to pay more because of his expertise. The difference was night and day. The Necchi user interface made a huge difference in how easy I found it to use. Maybe a different brand would suite you better. The old Pfaff machine is the only machine, besides a treadle, that doesn't make my skin crawl just looking at it. I would love a new treadle machine, but the cost is out of my league at the moment. I watched my grandmother make quilt after quilt on one, from scrap material just short of being bad enough to rip up and use for mops.